Industrialization is sort of like pumping iron, it whips a nation into shape – it is impossible to achieve efficient production without order and discipline. For developed countries, it’s the tried-and-true steroid for jump-starting the economy. Even for the average household, industrialization has worked its magic. That is, unless you still roast wild fish caught by wooden spears on scratch-made pit fires or, less appetizingly, bash the poor thing’s head on a rock then rip your teeth directly into the knocked-out animal’s less-than-tender flesh. What we would call artisan or from-scratch today can hardly be achieved in the absence of industrialization. Consider bread, the very edible incarnation of the word ‘rustic’. Made with yeast bred in incubators with machine-regulated humidity and temperature, and flour ground by furnace or electricity powered mills from commercially farmed wheat. Prior to industrialization, people sat around and waited for yeast to fall out of the sky (in the form of rain) into hollowed-out logs and grow into a usable amount. As a student, oh my do I love industrialization for its gifts. Just think: no industrialization = no food processor = 3 hours to make hummus. I practically live off that stuff, and ain’t no UW student got the time to mash chickpeas for 3 hours a day. but hey, it works handsomely right now. Take millstones and grind flour. and wade through the rivers. If you’re any bit like me and simply cannot help but gloat at the sight of meatballs on a lush, creamy bed of polenta, then this is already, without a doubt, your next obsession. If you’re with me on the gloating despite your mild disapproval of polenta, then you my friend, have just found your next every-weeknight-dinner. 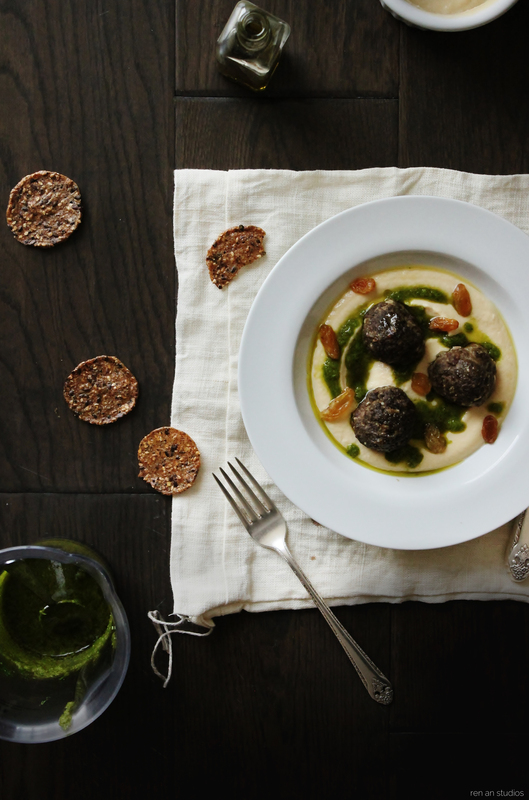 Savoury spiced meatballs, caramelized with minimal effort right in the oven, nestled on a bed of buttery silken hummus, are finished off with an ingeniously vibrant and zesty parsley oil and plump sultana raisins. Make an extra batch of meatballs, freeze the extras, and you’ll have dinner served in under 20 minutes any day of the week. To make the koftes, preheat the oven to 415 degrees F and line a large baking sheet with parchment. Place the all of the spices in a spice/coffee grinder and pulse until finely ground. Put the spice mix in a large mixing bowl with the remaining ingredients and mix gently with your hands until the mixture comes together. Add a little cold water if the mixture seems too dry. Divide the mixture into 24~30 portions and shape them into balls. Place them on the prepared tray and bake for 20 minutes, or until browned and cooked through. To make the hummus, place all ingredients in a blender or food processor and blend until smooth. Add a little water at a time with the motor running to adjust to a lusciously smooth consistency. It should be slightly thinner than regular hummus. To make the parsley oil, place all ingredients in a blender and blend until smooth. It is best used immediately, but will keep, covered and refrigerated, for two days. To assemble, spoon a large dollop of hummus into small salad plates. Splatter a bit of the parsley oil on top, then add a few koftes/meatballs. Finish with a small handful of sultana raisins and a round or two of freshly cracked black pepper. Serve with pitas, lavash, or seeded crackers.